It’s been two weeks now since the ink in my workbook has dried finishing off the first of my two Bible studies and I have taken this time to take a step back and think about what I have taken away from this study. DVD-driven, each of the video sessions is 30 minutes to 39 minutes long. Although the video is a short compared to some of the studies I have done the sessions went by so quickly that it feels like we just begun and now it’s over! Lisa is a great story-teller, you will find yourself captivated (as I did). Each session in the member book includes a video guide designed to help everyone capture the key ideas in Harper’s teaching as well as a short set of discussion questions. In addition to these session resources the member book includes a weekly Bible study to be completed independently. The “homework” is quite introspective and I found that I did more soul searching than I was comfortable with but I missed flipping the parchment of scripture. 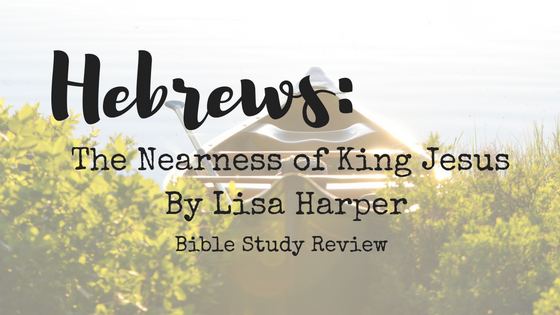 Hebrews: The Nearness of King Jesus is a wonderful study for new Christians but I felt like there wasn’t enough “meat and potatoes”. 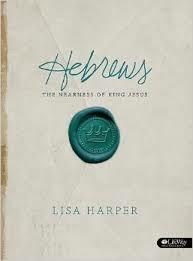 I loved seeing Lisa’s heart on those pages but unless you’re actively diving in the word yourself she really just skims over the book of Hebrews and dips her toes in Luke 5. I liked that I could sit down and complete my homework over a cup of coffee but, I missed digging for those treasures hidden in scripture for myself. The videos could be used as a stand alone just make sure you’re reading the Book of Hebrews so your not missing all the richness found in those pages. For example, week one’s assignment is to rent and watch To Kill a Mockingbird and think about several application questions. Not such an easy thing to do now in the post-blockbuster days and I’m not even sure if that title it’s available on Netflix to be honest with you. I did really enjoy the “extra credit questions for Bible nerds” section and I would recommend that you pay attention to those pages first if your not a “homework” kinda of student. This study is perfect for Beginners as it speaks of the uniqueness of God while revealing that Jesus is supreme, yet approachable. God used this study powerfully in our life to guide and used the story found in Luke 5 to re-affirm the changes we are already watching Him making in our life. Love all your ideas! Saved for later! I have a friend who will love the book! It’s so wonderful that you have something fulfilling like this in your life. And it looks like you are the perfect guide for beginner of Bible Study.